WASHINGTON, D.C., December 4, 2017 — Most volcanoes erupt beneath the ocean, but scientists know little about them compared to what they know about volcanoes that eject their lava on dry land. 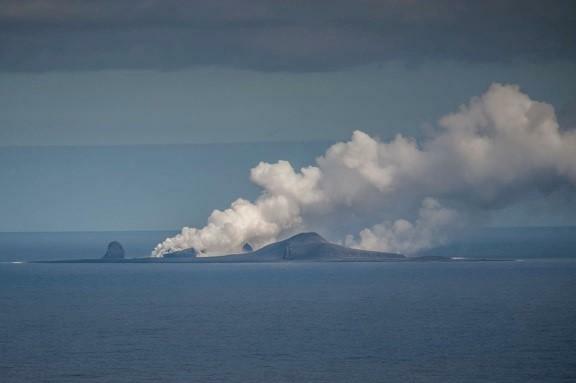 Gabrielle Tepp of the Alaska Volcano Observatory and the U.S. Geological Survey thinks that with improved monitoring, scientists can learn more about these submarine eruptions, which threaten travel and alter the ocean soundscape. "It's very difficult to study underwater volcanoes because it's hard to put instruments in the water, especially long-term," Tepp said. Depending on the size and depth of an underwater eruption, gas and ash may never break the ocean surface, or the gas and ash could create a volcanic plume with the potential to interfere with air travel. "The ocean is a big place so it's pretty unlikely that you're going to have a situation where a ship haphazardly wanders over an eruption, but there are a few that have come close," Tepp said. These unpredictable eruptions may also create a floating blanket of rocks, called a pumice raft, which can clog harbors and damage boats. "Eruptions that create a loud enough sound, in the right location, can travel pretty far, even from one ocean to another," Tepp said. "It makes you wonder, how many of these signals have we seen on distant instruments where nobody knew what they were, and it's a submarine volcano from halfway around the world?" We will grant free registration to credentialed journalists and professional freelance journalists. If you are a reporter and would like to attend, contact Julia Majors ([email protected], 301-209-3090), who can also help with setting up interviews and obtaining images, sound clips or background information.